On October 18, 2017 Fort Lewis College hosted a Fresh Check Day on campus. The purpose of the event was to bring awareness to mental health issues and to educate students about the various resources available on campus. There were many different interactive booths sponsored by different organizations and groups on campus that brought awareness to mental health and suicide. Students in ES480, Administration of programs in Exercise Science distributed information about various pressure points on the body and how they might relieve stress. The ES Cluster hits the ropes courses! Exercise Science Learning Community (Cluster) at the San Juan Community College High Ropes Course. The group went to Farmington, New Mexico for a half day to participate in their high ropes challenge. They participated on three different challenges. They started on the Alpine Tower where each student had the opportunity to climb on the tower and to belay. After an hour and a half on the Tower they were spilt into two groups where one group went to the Net Leap and the other group went to the Giant Swing. About an hour later, the two groups switched activities. This way all students had an opportunity to participate on each challenge. Trek Bikes recently published a profile on three of their mountain bikers, called Generation Now which included McElveen. He has been dominating the 2017 circuit with wins in the US National Title for Marathon distance cross country and the Firecracker 50 and is in third place overall in the Epic Rides Series. Read more here. at the American College of Sport Medicine Conference in Denver last week which was then discussed in Runners World. Click here for full details. So many Fort Lewis College professors not only have impressive educational credentials, but also a wealth of life experiences that color and inform their teaching. For Dr. Emily Houghton, assistant professor of exercise science, sports was the path that led her to what she has become today, including the 2017-18 winner of the FLC New Faculty Teaching Award. She was a collegiate soccer player at her undergraduate institution in upstate New York. Her role as a teacher began, not as a professor in a traditional setting, but as a teacher/mentor with the AmeriCorps’ Athletes in Service program in Chicago. Read full story. For Fort Lewis College alumnus Matt Shriver, the end of his racing career didn’t spell the end of his involvement with competitive cycling. Instead, his skills and education were diverse enough to blaze new trails for himself in the cycling industry. He’s now working at the highest levels of both the sport and the industry. Shriver (Exercise Specialist, ’08) raced for the Fort Lewis College cycling team from 2001 to 2006, and rode professionally full-time until 2009. That’s when he returned to FLC to coach the cycling team. In his two years coaching at FLC, the Skyhawks team were the overall team omnium national champions. Read the rest of this story. When Fort Lewis College star basketball guard Joshua Blaylock was a student at Lancaster High School in California, he took a class called “Fulfilling Your Potential.” The class was taught by his high school coach Sidney Melvin. When Melvin asked the students to write down the goals they wished to achieve, he took note of something very interesting and unique about Blaylock. Vincenzo Nibali with “podium girls” after winning the 2014 Tour de France. Photo from Outside Online. Recently, organizers of the professional cycling event the Tour Down Under made the decision to eliminate “podium girls” and replace them with male junior riders on the men’s tour, thereby breaking from the tradition of other major professional cycling events like the Tour De France, Vuelta a Espana and Giro D’Italia. Podium girls are a highly visible component of the awards ceremony at the conclusion of bike races. The women are often impeccably dressed in matching outfits while presenting winners with prizes, flowers and kisses on the cheek. The role of podium girls and, in some instances, podium boys provides a snapshot of the ways in which traditional gender norms are reinforced in sport. A special thank you to ES alum, Oscar Cosio, for bringing his 4th grade Physical Education classes from Ignacio Elementary School (pictured below) to a Play Day on Tuesday, 12/8, in the Whalen Gym. The 45 elementary school students participated in stations taught by ES 255 (Teaching Competencies) students Brent Hall, Selena La Paz, Shanell Leekya, Ryann Pierce, Daniel Rankin, Allena Wolfblack. It was a great experience for all! The Exercise Science Department is pleased to announce our new tenure track hire, Dr. Susumu Iwasaki. Dr. Iwasaki completed his doctorate at the University of Kansas in the Department of Health, Sport and Exercise Sciences in 2014. As a graduate of the Sport Psychology program, Dr. Iwasaki's research focuses primarily on athlete perceptions of team climate and mindful engagement in sport. He has co-authored several articles including The Efforts of Sport Psychology Professionals to Assist Sport Administrators in Evaluating Youth Sport Programs. While at Kansas, he was a key member of the Sport and Exercise Psychology lab where he mentored both undergraduate and graduate research projects. During his graduate program, Dr. Iwasaki was awarded the Wayne Osness Outstanding Doctoral Student Award. In addition to his academic training, Dr. Iwasaki also has an extensive applied background in sport coaching. For example, he coached high school basketball in Japan over 10 years. He is presently working towards becoming a certified consultant through the Association for Applied Sport Psychology. Dr. Iwasaki comes to us from Ibaraki University in Japan via the University of Kansas. He was a Jayhawk and now he is a Skyhawk. The Exercise Science Program announced 2016 award winners and 2016-17 academic scholarship recipients during the Exercise Science Annual Social on Friday, April 22, 2016. 2016 Fort Lewis College American Kinesiology Association Scholar: Thomas Poole of Durango, CO.
2016 Major of the Year (AT) Honor: Jenna Krizo of Brea, CA. 2016 Major of the Year (ES) Honor: Stephanie Teaman of Riverside, CA. 2016 Outstanding student in Exercise Physiology: Brooke Milliet of Durango, CO.
2016 Outstanding student in Sport Administration: Kate Bayes of Sonoma, CA. 2016 Outstanding student in Exercise Specialist: Hillary Morris of Creede, CO.
Spring 2016 Honor Cord Recipients are; Keith Bender, Durango, CO; Casey Farrell, Breckenridge, CO; Sofia Gomez Villafane, Los Gatos, CA; Mary Rambo (AT), Durango, CO; Mariah Starbuck, Steamboat Springs, CO; Matthew Steffens, Albuquerque, NM; Stephanie Teaman, Riverside, CA, and Julia Villani (AT), Golden, CO.
Nickolas Martin of Los Alamos, NM. Nathan Mitton of Durango, CO.
Tierra Jishie of Ganado, AZ. William Hensen of Highlands Ranch, CO.
Hillary Morris of Creede, CO.
Eljin Gorman of Farmington, NM. Assistant Professor of Exercise Science Emily Houghton, PhD and colleague Jennifer A. Bhalla, PhD published a research article entitled Invisible Pioneers: Exploring the Experiences of African American Female Athletes in an edited called Modern Sport and the African American Experience. The book, edited by Gary Sailes, PhD is a collection of essays that focuses on the intersection of race, gender and sport. 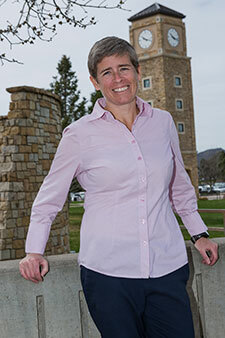 In addition, Assistant Professor of Exercise Science Missy Thompson, PhD along with collaborators Jeff Seegmiller EdD, and Craig P. McGowan, PhD from the University of Idaho published a research article entitled Impact Accelerations of Barefoot and Shod Running in the International Journal of Sports Medicine. Several Exercise Science, Athletic Training and Adventure Education students were chosen to present their research as part of the Fort Lewis College Undergraduate Research & Creative Activities Symposium that occurred on April 21, 2016. The symposium brings together student work from many different departments across campus. Two courses, ES/AT 495 Research Design and Development as well as ES/AT 496 Senior Seminar, provide the platform for our students to develop their research projects during the academic year. Thomas G. Poole a K-12 teaching major gave an oral presentation on his project entitled: Tension Releasing Exercises Reduce Perceived Stress in College Students. Tom’s project was supervised by Professor Cathy Simbeck. In addition, Craig Smith, Matt Steffens, Mariah Starbuck (all exercise physiology majors) and Stephanie Teaman (athletic training major) gave an oral presentation entitled, The Role of Deep Pressure Sensory Feedback During Gait which was supervised by Assistant Professor Missy Thompson. The Undergraduate Research & Creative Activities Symposium is a great way to showcase the excellent and diverse work accomplished by our students during the course of the year. Cathy Simbeck's adaptive exercise class does a lot more than listen to lectures and read books. Former student Rotem Ishay and current students Josh McDowell, Maddie Kruger, Alex Kilman, and Gus Allen are up to some cool stuff. They are conducting research relating pulmonary pressures at altitude and performance. Watch this video and read more about their research here.